The objective of this raid was to gain information about a very important part of the enemy trenches. 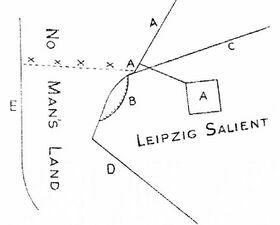 Large mounds of earth had appeared at the point of the salient, which looked as though mining was in progress, and it was clear that there were several machine-gun emplacements in, or near, a quarry shown in our photos of this part of the German line. Another feature of the air photos was a square trench, or the “Bull’s Eye”, about 30 yards back from the front line. The curious shape gave rise to suspicions that it was being used as a very strong point in defence, which afterwards proved to be the case. To find out about the Bull’s Eye trench. This needed a separate party, which would have to go forward to the third line, and work independently of the rest. To find out about the quarry. To get as many prisoners as possible, and so extract general information about the troops holding that part of the line, and the methods of defence. Volunteers were called for, and four officers—Lieut. Barnes, with Lieuts. McKerrow, Margerison and L. Machell—and 82 O.R. were chosen. The date of the attack was not published until the actual day arrived. Training for the raid began about three weeks before it took place, and there can be no doubt that the careful drill and rehearsal of the advance was the main cause of the final success. A piece of ground was chosen near Bouzincourt, about three mile behind the British line, and there the section of trench to be raided was exactly reproduced with the aid of the air photographs. The programme of training varied slightly, but nearly every night the actual advance was practised under the eye of the C.O. and the most minute details criticised and modified. During the day bomb-throwing was practiced, and the men had two hours’ physical training, also instruction in conducting prisoners and carrying wounded. By the time the party moved from Bouzincourt to their final bivouac in Aveluy Wood, every man knew his job and his exact place in the scheme. On the afternoon of the 4th of June the party moved to Aveluy Wood, and pitched bivouac tents under the trees among dense undergrowth, well hidden from view of aeroplanes. On the morning of the 5th it was given out to the men that the raid would be that night. There had already been careful dress-rehearsals, and every man knew the best way to carry his kit, so when the order was given to prepare to move, everyone was ready in half an hour, with boots, revolvers, torches, and compasses, and with faces blackened. We moved up at 9pm and got into position at 10. At 10.20 the tape-laying party moved across No Man’s Land in the direction of the point of the Leipzig Salient, Lieut. Margerison leading. The Boche probably expected us to go out at Oban Avenue, as it was the most direct line of approach, but we went out at Tindrum, about 100 yards north of Oban. At 10.30pm the enemy put over several salvoes of 12 pounders immediately at the head of Oban, which would certainly have caused heavy losses had the raiding party been there. At 10.35 the Ammonal torpedo party followed along the tape, halted, and lay down half-way across, the main body following and lying down immediately behind the torpedo party. At about 11 o’clock the bombardment of the enemy trenches began, and lasted till 11.13’, when the artillery “lifted” and fired on points behind the front line, allowing the raiding party to go forward. At 11.13’ the torpedo party went forward and exploded what remained of the enemy wire, leaving and entrance for the main body. Lieut. Mckerrow went forward to the Bull’s Eye and explored it, succeeding in taking several prisoners, and returned after staying about 10 minutes. Sixteen prisoners were taken in all, eleven of whom were safely conducted to our trenches. The remaining five were killed in offering resistance or while attempting to escape. The retreat was sounded by means of Klaxon horns, and was heard by every one. The return journey was difficult, as the enemy had opened fire immediately on our front line as well as on their own, and were searching No Man’s Land with high explosive shells. A. “Bull’s Eye”, B. Quarry, C. Communication Trench, D. German Front Line Trench, E. British Front Line, X X X X - Our line of advance. “At 5 past zero both line crawl towards about 30 X, and remain till at 7 past zero our artillery lifts on to enemy 2nd line and rear, and both lines move forward at steady double. On arriving enemy 1sy line, all pass over, leaving three men—front line—to attend to a M.G., which will be indicated”. Killed—Lieut. W.S. Barnes; Lance-Corporal Copeland; Privates Allison, Little Richardson and Thompson. M Missing—Sergeant Stephens. “Several enemy searchlights were in action during the bombardment on other parts of the front”. ↑ L.M. initials of Lieut. L. Machell.